In 13 seconds, death came crashing on Purosttam Timsina, 22, who was flying the paraglider that plummeted with a tourist in Kalimpong on Saturday. A video shot by the tourist, Gaurav Chaudhury, 35, from Patna, has cleared the air on the sequence of events that led to the crash. Chaudhury is nursing a fractured leg and hand but Timsina, a resident of Pokhara in Nepal, was not so lucky. 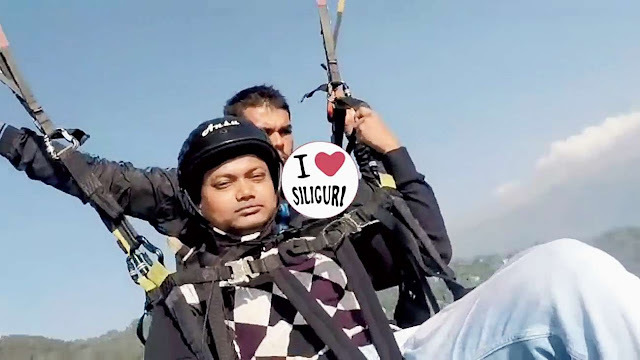 The video, uploaded by a Facebook page, I Love Siliguri, is only 1.14 minutes long but has opened a can of worms suggesting negligence and dismissing several claims made by the Kalimpong Paragliding Association. To start with, the video shows Timsina was not wearing a helmet, a clear indication of negligence. The pilot died of head injuries when the paraglider crashed onto a concrete rooftop. The video also suggests that the pilot was neither trying any stunt nor was there a strong gust of wind as claimed by the Paragliding Association. Forty seconds into the video, Chaudhury is seen screaming out of joy and the very next second, the paraglider snaps. For 13 seconds, Timsina and Chaudhury are seen holding on to one chord of the paraglider, the other half having snapped. During the freefall, Chaudhury has a blank expression, while Timsina has horror written all over his face as he holds on to the tourist with his right hand and clings on to the other chord with the left hand. Fifty-four seconds into the video, the duo land on the concrete rooftop but the camera captures the other half of the paraglider slowly drifting away in the sky. This is a clear indication that the paraglider had snapped. A day after the accident, two eyewitnesses, Bipan Pradhan and Anish Saha, had said they had seen the paraglider split into two midair. Bipen Tamang, the spokesman for the paragliding association, had, however, said it was “impossible” for the paraglider to tear into two and said the association were ready to “face any investigation”. “I was told that the carabineer (a specialised type of shackle/metal loop which is used in mountaineering) seems to have snapped. It is impossible for the paragliding sail to disintegrate into two halves just like that,” said Tamang. On the day of the accident, Tamang had said that the pilot was trying to control the paraglider after a strong wind dragged it away from the landing spot when the sail brushed against a tree before it plunged 40ft down. The video, however, shows nothing like that.